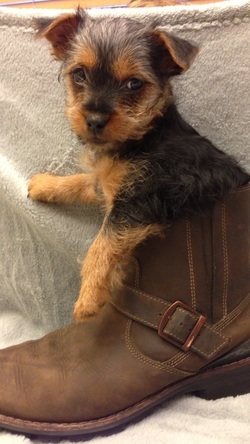 Silky Terriers, just like Yorkies, are born black and tan. However most Silky Terriers gradually turn from black to varying degrees of blue and silver. Silkies do not have coarse hair. Their coat is just like their name implies, "Silky". 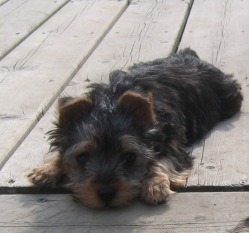 Yorkie pups are prone to hypoglycemia (diagnosed by listless behavior and shakiness). Silkies are not prone to hypoglycemia. Silkies tend to be easier to house train and are not yappy but, still make excellent watchdogs and alert you when visitors arrive. Silkies do not shed, and do not mat as easily as a Yorkie. Regular grooming with a brush and comb is required a couple of times a week, if you choose to keep their coat long. Yorkies do not shed but, they do mat much easier than the Silky Terrier. The Yorkshire Terrier requires intensive brushing and combing on a daily basis. The Yorkshire Terrier has a very long, straight coat which is golden-brown at the head, chest, and legs and a distinctive steele grey from the base of the neck to the tip of the tail. The Yorkie is only supposed to be a 'slate' color of blue and the coat is usually heavier and floor length (when kept in show condition). The Silky Terrier has a long, smooth, silky, and shiny coat. The coat can be any shade of blue from a light steele blue, to pigeon blue, to a darker slate blue, and many shades in between. The Silky Terrier body has strength and muscle and weighs between 8 to 11 pounds. They seem smaller than their weight sounds because they are of a sturdier build and are great for children! The Yorkie has an approximate weight of 4 -7 pounds (not to exceed 7 lbs though). The Yorkshire Terrier is tolerant of older children, provided they respect its personal space. Due to its small size and bold temperament the more fragile Yorkshire Terrier is not recommended for young children unless carefully supervised. The Silky Terrier has a wedge shape to the head (longer muzzle and flatter skull) with ears that stand erect on top of the head. They are a bit longer in body than tall at the shoulders. Yorkshire Terriers have a small, flat head, with ‘V’-shaped ears. The ears are erect but may tend to sit on the side a bit. They usually have a larger base than the Silky ear. The Yorkie is a square dog meaning that it is as long as it is tall. This is Maxine and Sanchez not very far behind.